The Apollon Hotel Kos is located less than 1 mile from Kos Town and is a 4-star property that offers a wide range of on-site amenities. This includes an outdoor swimming pool, tennis court and children’s playground. The property is just 0.2 miles away from the nearest beach so you are only a short walk to the golden sands. 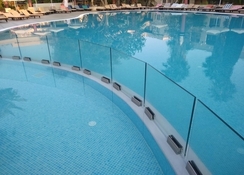 The hotel is close by to several tourist attractions such as the Tree of Hippocrates, Kos Castle and the Lido Water Park. Suited to couples, groups of friends and families with children, the Apollon Hotel Kos provides a central location with a host of amenities so you can kick back and relax in style. The Apollon Hotel Kos is 0.6 miles from the lively Kos Town. 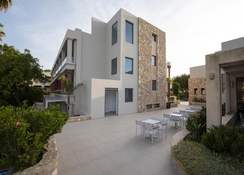 It is only a short walk away to the nearest beach (0.2 miles) and the property is close to several tourist sites including the Tree of Hippocrates (1.4 miles), Kos Castle (1.3 miles) and the Lido Water Park (10.2 miles). The Kos International Airport is 13 miles away from the hotel. 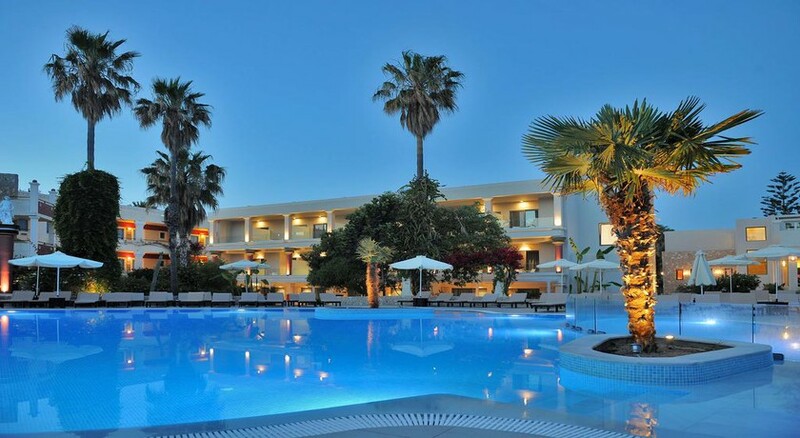 There are three room types on offer at the Apollon Hotel Kos which has 169 rooms in total. Double/Twin Rooms have capacity for two people while there is the option of a Triple Room for three guests. For more modern accommodation there are Deluxe Twin Rooms for two people. All the rooms at the hotel have air conditioning, a balcony and satellite TV. You can avail of the all-inclusive option at this property. There is an on-site restaurant that serves local and international food and is open for breakfast, lunch and dinner while you will also find a bar where you can get a selection of snacks and drinks. The surrounding area of the property has a selection of restaurants and bars too. There is an outdoor swimming pool at the hotel as well as a Jacuzzi and facilities for tennis, darts, billiards and a children’s playground. You will also find a games room at the property and there is free WiFi too. The hotel is nearby to the Lido Water Park and there is a mini-golf course 3.6 miles away. The beach is just a short walk away or you can hire a bike or a car and explore the island of Kos at your leisure. Apollon hotel was first class! Me and my wife decided to go to kos for are honeymoon and saw the apollon hotel on the teletext holidays website! We did some background checks on the hotel what had lots of great reviews so we decided to book there. When we arrived we were greated politely bt the hotel receptionist and when we got to are room it was 2 singles but we had payed for a double. I went and explained the situation to the receptionist and he asked if i could cone back tomorrow as it was late so i did and there were no rooms available untill the following day. The following day we moved rooms! And what a room it was it was hudge with a massive souble bed and a balcony! We were very pleased and could be happyer about it. The food at the apollon was brilliant! 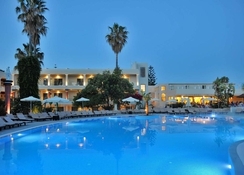 I have been to ither all inclusives and thought it was ok but the apollon was the best ive had. Loads to choose from and diffrent things everyday. The cleanliness of the hotel was brillaint also! Fresh towels and bed made everyday and the cleaners there must have been working around the clock to keep evething in check! They even made diffrent animals out of towels and left them in the center of the bed which was a nice touch. The location is great because it is well away from the loudness of kos town but close enough to get to for having a look around or getting to the beach! It is abit of a walk so i would advise hiring bicycles which are just outside the entrance of the holtel door! We hired them for the entire 10 days we stayed and they were very reasonable on price! Think it was €40 for the pair of us! If you dont get a bicycle then its abit if a long walk! The staff at the apollon are lovley and very polite especially synthia workig the bar who was always very chatty and a pleasure to be around. The pool was lovley and clean and there were plenty of sunbeds. If you are thinking of going to kos for a holiday then i couldent advise more than to boo this place it is the best!!!!! !